Michael Jordan’s Restaurant opened in Oak Brook in the summer of 2017, following the success of Michael Jordan’s Steak House in downtown Chicago, and other restaurants by the Cornerstone Restaurant Group. What they know better than anything is steak, which makes the new Steaksmanship Series at the Oak Brook restaurant a must-do if you’ve ever wanted to learn more about cuts, quality, history, and pairings that bring out the best in steak. Chef Gary Baca is the man who’s bringing the concept to life at Michael Jordan’s Restaurant, and he’s the kind of chef you can absolutely trust with your steak. He has worked at Chicago area restaurants for more than 20 years, specializing in steak, seafood, and other progressive American cuisines at some of the city’s most well known restaurants. He has been at Michael Jordan’s for a year, and now he’s exporting the innovative, flavor-forward ideas to the Western Suburbs. Take, for example, this new Steaksmanship Series. The steak-tasting experience serves a collection of three signature cuts, together on a rotating sharing plate. They’re paired with three specialty salts and three handmade sauces—all chosen by Chef Baca because of their individual intensities and qualities, but also because of how well they all work together. When you visit, hopefully Chef Baca is there to introduce you to the steaks, because after talking with him, you’ll understand how much he knows about steak. 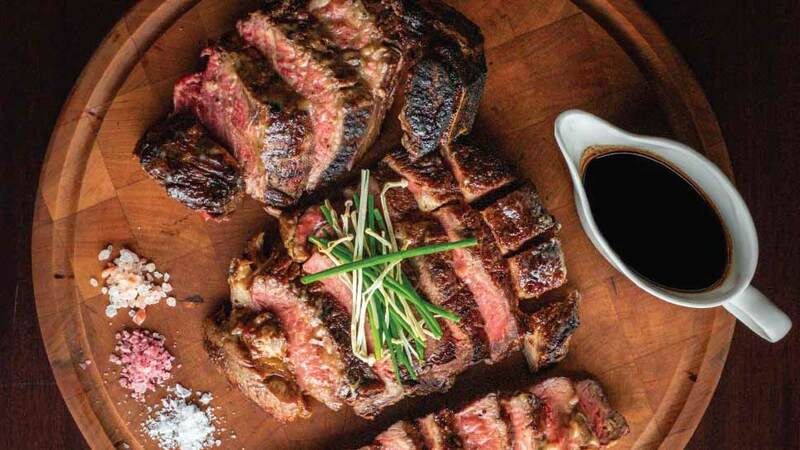 The flight includes a 16-ounce Bone-In Filet Mignon, a 16-ounce Linz Heritage Reserve Prime Delmonico, dry-aged for 45 days, and an 8-ounce Mishima Reserve Ultra American Wagyu Strip Loin, Manhattan Cut. The bone-in filet is a favorite in Chicago at some of the city’s best steak houses. It has a strong, beefy flavor because it’s cooked on the bone, but is much more tender than a lot of steaks. The Delmonico just happens to be Michael Jordan’s favorite, and is the signature steak at the restaurant. And the Wagyu is a trendy steak, made from a breed of cattle that originated in Japan. “In my mind, when we picked our steaks, I wanted classic with the Delmonico, contemporary with the filet, and modern with the Wagyu,” Chef explains. What takes the tasting experience to the next level is what they’re served with. First, three salts: a Pinot-infused sea salt, a Himalayan pink salt, and Maldon sea salt—presented together beautifully in red, pink, and white colors. Then the sauces: balsamic ginger jus, truffled porcini bordelaise, and Roth Buttermilk Blue fondue. “The salts and sauces all have great flavor profiles that run the gamut,” Chef says. During our conversation, he talked as much about sauces and salts as the beef itself, which gives you an idea of how much time and energy he spent choosing the right accompaniments for the Steaksmanship Series. Michael Jordan’s is open for lunch and dinner daily, serving everything from salads to seafood to signature burgers, and of course, steak. The Steaksmanship Series can be ordered anytime, and can be paired with craft beers, wines, and other drinks. You can also see memorabilia and photos inside the restaurant that bring the namesake icon’s career to life. Michael Jordan’s Restaurant is located at 1225 W. 22nd Street in Oak Brook, (630) 828-2932, michaeljordansrestaurant.com.